Glassman Wyatt Tuttle & Cox Welcomes New Associate Christopher Lewis - Glassman, Wyatt, Tuttle, and Cox, P. C.
Memphis, Tennessee civil trial litigation boutique firm Glassman, Wyatt, Tuttle & Cox, PC welcomes its newest associate attorney, Christopher (Chris) M. Lewis, to the firm. 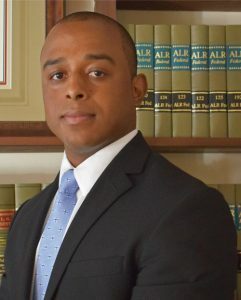 Mr. Lewis joined Glassman, Wyatt, Tuttle & Cox as an Associate Attorney in September 2018 after working in private practice at another local law firm. He is a zealous advocate, and has demonstrated his legal acumen in several trials and hearings, including recent arguments to the Tennessee Court of Criminal Appeals. Prior to joining Glassman, Wyatt, Tuttle & Cox, Chris was an Associate Attorney for a criminal defense firm where he drafted several Petitions for Writ of Certiorari to the United States Supreme Court. He also represented several criminal clients across West Tennessee in a diverse range of legal proceedings. During law school, Chris clerked for Magsitrate Judge Charmiane Claxton in the United States District Court for the Western District of Tennessee; Memphis Light, Gas and Water (MLGW); and several other legal entities around the city of Memphis. In addition, Chris served the state of Tennessee through his two-year tenure in the office of the Minority Leader of the Tennessee State Senate in Nashville.